One of the most useful and fun toys in my antenna arsenal is the C.Crane Twin Coil Ferrite antenna. This $99.95 antenna can dramatically improve your AM reception with virtually any radio. I have used it with many radios from portables to large table tops and it has worked equally well with almost all of them. The “Twin Coil” can bring virtually any decent radio to life making it far more sensitive and selective then you ever imagined it could be. More good news…it doesn’t matter whether the radio has external connectors or not. It can also make many radios far more convenient to use because of its immense adjustability and flexibility as you will see. The Twin Coil Ferrite Antenna is an active, amplified and tuned AM antenna designed to dramatically increase signal levels of weak and medium strength AM stations. It is a patented design using an ingenious method of extracting the maximum signal level out of its huge ferrite loopstick within the Antenna Element. It is connected via a 5 foot cord (you can also buy 25 and 50 foot extensions if needed) to the Tuner Control box which sits next to your radio. The control box contains an On/Off switch, dual concentric fine and coarse tuning knobs as well as input/output jacks. This box connects to your radio through another five foot patch cord which outputs to an RCA plug, an included adapter to two bare wires for connection to radios with screw terminals or spring clips, or the Ferrite Stick which is used with no direct connection to the radio…simply place this sender unit in the ‘sweet spot” near the radio’s built-in ferrite rod antenna. 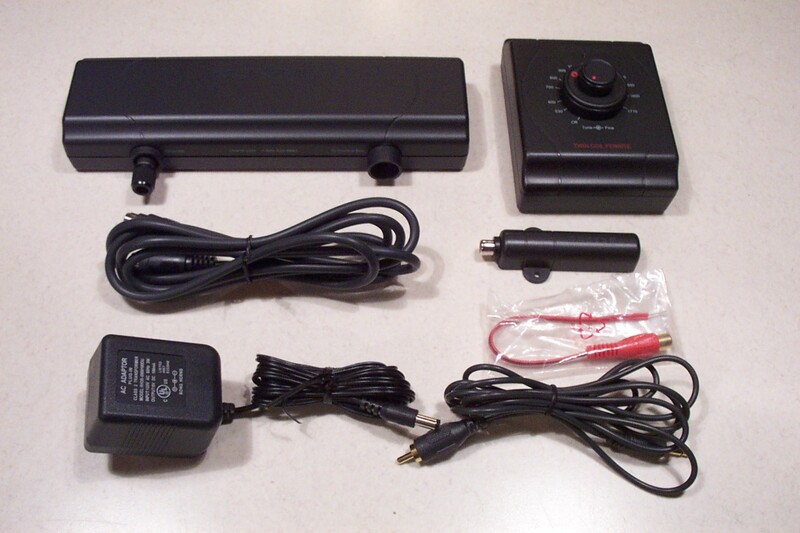 The Tuner Control Box holds a standard 9 volt battery which provides long life, or it can be used with the included 9 volt AC Adapter for more permanent installations. The C.Crane Twin Coil Ferrite antenna is exceptionally flexible in terms of placement and method of connection. Exactly how you use it depends largely on the radio you will be using it with, and partly on your location and listening environment. In my wood frame home I use only the supplied cables, with the receiving element within 5 feet of the radio. Since it can be moved independently of the radio, it is very easy to position and rotate it to null out noise or interfering signals. It has very good nulls and exceptional gain. If your home or office blocks AM signals, such as mobile homes or brick and steel buildings you can place the receiving element on a windowsill for greatly enhanced reception. It can even be remotely mounted up to 75 feet away with the accessory extender cables, and can be mounted outdoors if needed. The only problem with remote mounting is that the antenna is highly directional. So unless all your desired signals will be coming from the same general direction you may want to find a way to rig a rotor to it…this will require some ingenuity as the antenna is not prepared with a standard mounting option. It can certainly be done and many owners are happily using their Twin Coil antennas with rotors to great advantage. And even without a rotor you will still get greatly improved reception and you may find one position that works perfectly for you. Experimentation is the key here. 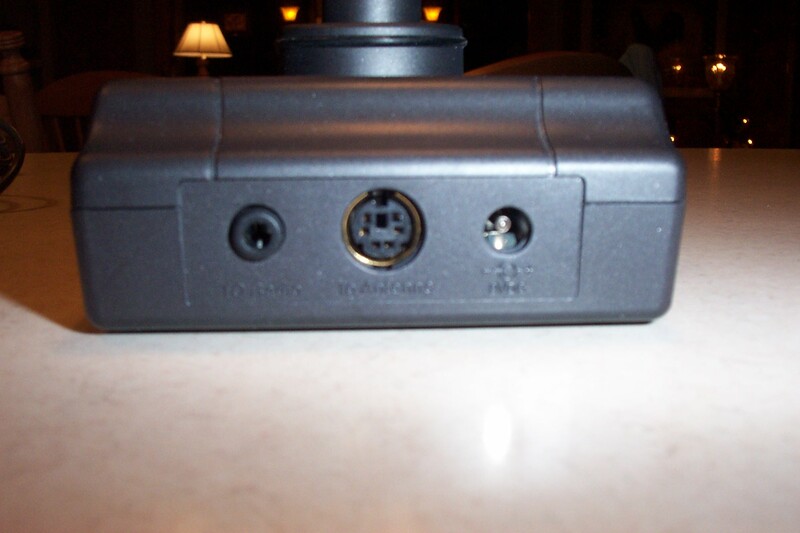 An external ground connector is available for outdoor installations. With most portable radios the ferrite stick sender unit is the best way to go. 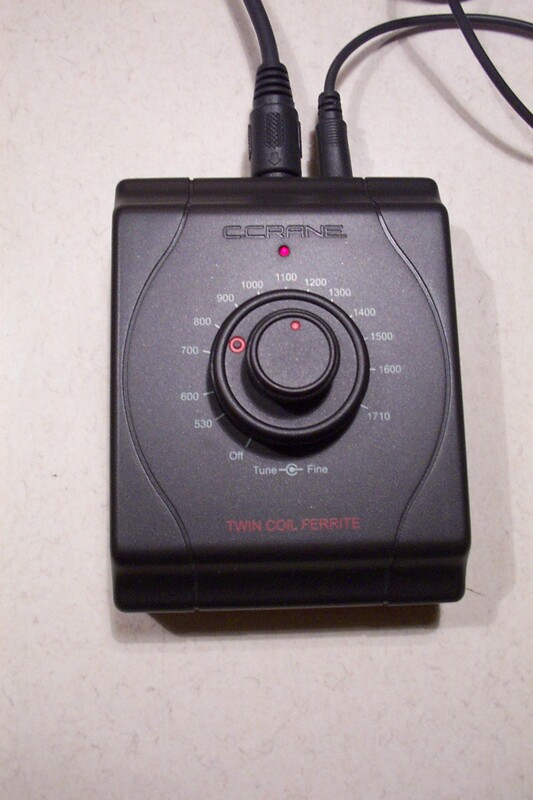 Many such portable radios don’t have external antenna connections and you have no other choice. Also, many world band portable radios attenuate AM signals from their antenna input jacks to prevent strong AM signals from swamping the radio’s front end and interfering with SW signals. With such radios you will get a much stronger signal with the sender than with the direct connection. The trick is finding that “sweet spot” where the ferrite sender can transfer maximum energy to the radio’s built-in antenna. The best way to do this is with the weakest daytime signal you can find. Move the sender along the top side of the radio while using the coarse tuning control on the Tuner Control Box until you hear the signal level jump. Now move the sender slowly in all directions for maximum signal…that spot will be the best for all stations and you don’t have to repeat this adjustment more than once. You can use the supplied hook and loop fasteners to mount the sender there permanently or small pieces of tape for an easier-to-remove solution. With some of my larger radios I simply sit the sender in position and don’t attach it at all. If your radio has an antenna connection (either a jack, screw terminals or spring clips) you can hook up the Twin Coil Antenna directly not using the Ferrite Stick sender unit. Here are a few tips to get the most out of a direct connection. First, know your radio. If your radio has an antenna jack, first determine if using that jack disconnects the radio’s built in AM antenna. Some do, some don’t. If the owner’s manual isn’t clear on this (as is often the case) the way to tell for sure is to put a plug into that jack and see if your AM reception disappears or stays the same. Obviously, if it disappears, you know the internal antenna has been disabled…that is desirable. If reception stays the same, you will be getting signal from both the internal antenna and the Twin Coil when you use that jack. While this is generally not the best arrangement because it reduces your ability to null interference with the Twin Coil antenna element, in practice it often doesn’t matter very much. You may receive some interference from the built in antenna, but usually the signal from the Twin Coil is so much stronger that the signal from the internal antenna is overwhelmed by the stronger signal from the Twin Coil and therefore ceases to be much of a problem. Also, if you find that the direct connection yields lower signal strength than using the Ferrite Stick sender unit that means your radio has AM attenuation on the input jack and you should use the sender instead. If your radio has antenna screws or spring clips for bare wires, your internal antenna will still be active as well…those screws and clips merely connect to a few turns of wire wound around the internal rod antenna. Try the direct connection versus the sender to see which works best for your radio. Finally, many new users first try the antenna at night and report that it does nothing. That is because they don’t understand that at nighttime signals tends to be much stronger. To compensate, the radio’s built in AGC (Automatic Gain Control) works to reduce their strength to prevent overload. Adding the Twin Coil Antenna still increases the signal strength even more, but the radio’s AGC just turns the gain down further to compensate, so you may not notice the effect. This also makes it much more difficult to find the sweet spot for the sender, which is why I recommended initially using a weak daytime signal. This doesn’t mean that the Twin Coil does nothing at night. It can still improve reception dramatically by reducing fading and interference and by giving you more directional control. Some night signals are dramatically cleaned up using this antenna, even though initial observations may reveal less of a difference. USING THE TWIN COIL/HOW WELL DOES IT WORK? I have been experimenting with antennas for a long time, from random wires to passive and amplified loops of all sorts but I have to tell you that the C.Crane Twin Coil antenna is nothing short of a breakthrough at its price point. I have used it with portable radios from C. Crane, Sony, Sangean, Eton, Tecsun even my vintage Zenith Trans-Oceanics & Grundig Satellit’s. It has helped each of them amazingly. And my Eton E-1 which lacks an internal ferrite rod antenna simply shines with the Twin Coil connected directly. One of the big benefits of the Twin Coil antenna is that it can be positioned and rotated independently from the radio. This is a real necessity with big tabletop radios such as Trans-Oceanics and Grundig Satellit’s. The radio can stay put while you rotate the antenna for best reception. Its ability to null out noise sources is sometimes phenomenal. Here’s one example. One of my favorite tube-type receivers is a Zenith Trans-Oceanic A600L. Unfortunately it picks up lots of interference from my computer in my home office, rendering out of town AM signals unlistenable. With the Twin Coil I found a great spot for the Antenna Element which was only a few feet from the radio, but in that spot the interference virtually disappears, leaving only a strong signal. The difference is astounding and I can actually listen to stations that were completely unlistenable before. Most of my radios show substantial improvement not only in signal level but in quality of reception. The Twin Coil is MUCH more sensitive than my passive loop antennas and much more convenient because with those loops you have to rotate the radio along with the loop for best performance and sometimes that is not convenient. I do own a few radios which show less obvious improvement using the Twin Coil Antenna…those radios already have extreme sensitivity, although the Twin Coil does still improve some signals even with those super hot radios. 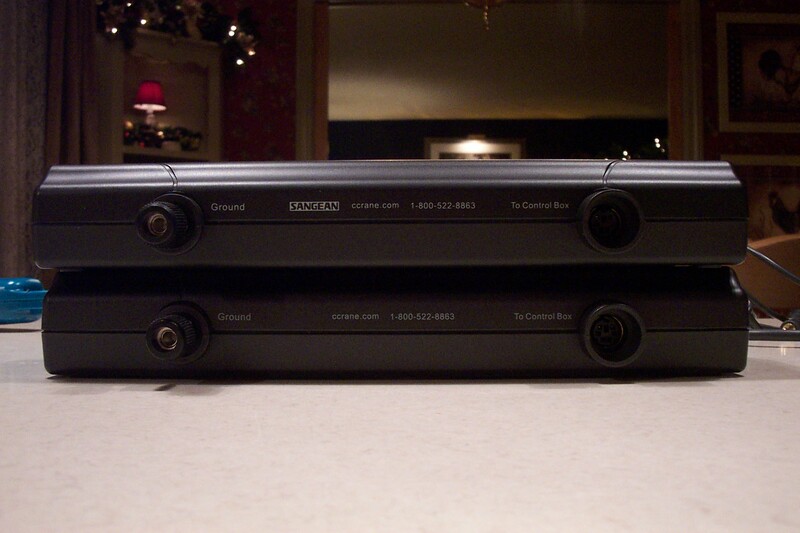 But in general the C.Crane Twin Coil Antenna can often times transform your listening experience. I own three of them and I can’t recommend it highly enough. At $100 it will usually do more for your AM reception than buying a new radio.